Let’s call Terry Gilliam’s The Zero Theorem a wildly ambitious and sometimes invigorating mess. Only an imagination as fertile as Gilliam’s could create a movie that playfully poses the biggest of questions: Is the entire universe heading for oblivion, thus rendering all human activity meaningless? To aid in this out-sized inquiry, Gilliam concocts a dystopian world in which a man named Qohen (Christoph Waltz) receives an assignment from a character called Management (Matt Damon). Qohen’s job: to find a mathematical equation that proves that all life adds up to nothing — or something like that. Not surprisingly, the assignment drives poor Qohen batty as he encounters a variety of strangely colorful characters: his supervisor (David Thewlis), a woman (Melanie Thierry) sent by Management to arouse Qohen sexually, and a whip-smart teen-ager (Lucas Hedges), who happens to be Management’s son. At one point, the distressed Qohen engages in a form of therapy with a virtual therapist played by Tilda Swinton, unrecognizable in the recent Snowpiercer and almost as unrecognizable here. Near the beginning, Qohen — who refers to himself either as “we” or “us” — requests permission to work at home: It seems he once received a phone call from someone purporting to explain the meaning of life, but the connection was lost. He’s hoping the mystery caller will get back to him. Ridiculous? Of course, but with Gilliam, it’s not so much the story he tells that matters, but the world he creates. Working from a screenplay by Pat Rushin, Gilliam drops characters into the middle of a tipsy world to see how they’ll react. This time, Gilliam creates a funky reality that mixes high tech gadgetry and low-tech grunge. Qohen lives in an abandoned, rotting church (think metaphorically), where he plies his trade in front of a large screen. It’s possible to see The Zero Theorem as an extension of Gilliam’s work in the much-admired Brazil, although devotees of that movie may not find this one quite as appealing. 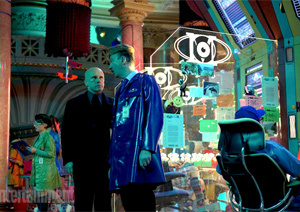 The Zero Theorem overflows with boundary-pushing visual invention: a crucifix in which the head of Jesus has been replaced by a security camera, for example. Moreover, the actors are game for anything Gilliam throws at them, including some of the year’s most preposterously amusing costumes from designer Carlo Poggioli. The lack of a compelling story eventually takes its toll, but Zero Theorem is the kind of visual feast that Gilliam fans will tolerate better than those who haven’t joined the club.